Leading people and caring for fish have a lot in common. Designing an office is like creating a fishpond; taking care of an office is like nurturing a habitat; and running a business is like fostering an ecosystem. This is the business world according to Po Chung (‘69 Fisheries Management), who founded and led DHL International and is now leading an effort to reform education in Hong Kong. 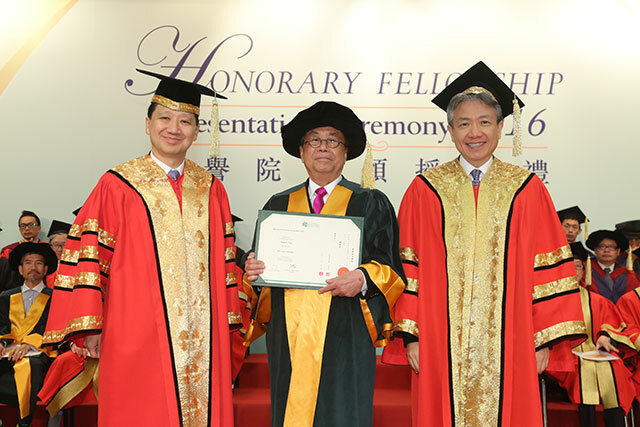 Po Chung receiving his honorary fellowship at The Education University of Hong Kong in early June. But Chung’s story is less about becoming a big fish in a big pond, his awards, and his accomplishments as a philanthropist and artist. It’s more about his humanistic approach to managing people—a perspective shaped by his liberal arts education and life lessons learned at HSU. Chung grew up poor in Macau during the 1949 Chinese Civil War. He left grammar school briefly because his parents could no longer afford it, and began fishing with his family for a living. Throughout college in Hong Kong and, later, at Whittier College in California, he was exposed to classic literature so that by the time he came to HSU in 1965, he was well-read and well-rounded. But it was HSU Professor Frank Watson’s business law class that struck a chord. Caring, competence, and character. The attributes Chung saw in Watson are ones he believes leaders need to manage a healthy business ecosystem. Leaders who inspire and engage their teams are necessary for a business to thrive, especially now. Today’s economy is dominated by service, not manufacturing, industries that require a workforce to think critically and creatively. Chung is now at the forefront of cultivating future and current pond keepers. He founded the Hong Kong Institute of Service Leadership and Management, which promotes, advocates, and offers service leadership training. He is also leading the push to integrate more humanities and social sciences into the curriculum at eight Hong Kong universities. Chung continues to have an impact at Humboldt State as well. In 2006, Chung and his wife, Helen, made a charitable gift to establish the Chung-Watson Lecture Series in Business Ethics in tribute to Watson, while ensuring current and future students have a forum for leadership discussions. And this fall, his new books “Service Reborn” and “25 Principles of Service Leadership” will be part of a reading series for HSU Business Professor Michelle Lane’s class.